Listen to this track by Ottawa-born former folk-psych guitarist turned mystical folkie singer-songwriter Bruce Cockburn. It’s “Let Us Go Laughing”, the centerpiece to his 1971 album High Winds, White Sky, his second. This song is a culmination of where Cockburn had come by this time in his career. Behind him were his days at Berklee College of Music in Boston where he studied jazz improvisation and composition in the mid-sixties. Also behind him was his journeyman period as a guitar player and keyboardist in folk rock and psych bands, some of which appeared as opening acts for The Lovin’ Spoonful, Cream, and The Jimi Hendrix Experience by the end of that decade. But something else had risen to the surface by the time this song was written; a feel for lyrics that reflected his rich inner life and his gravitation toward the spiritual. His solo career would be a definite departure from what he’d been doing while serving time in bands. Something which had stuck around were his penchant for Mississippi John Hurt-style blues picking with his right hand, and complex jazz chords and open tunings managed by his left. His influences coalesced by drawing from his days on the Ottawa and Toronto folk and folk-rock scenes, and in the folk and jazz scenes in Boston while he was briefly a student there. All the while, he was also thinking about his independent pursuits with spirituality and the occult, ranging from the works of Alistair Crowley to the New Testament. All of this played into his strategy to become a solo artist who was unfettered by any of the scenes he had been a part of when playing in bands, taking acoustic folk-blues and European medieval modal styles and matching them with impressionistic lyrical journeys through landscapes where the natural world meets the spiritual one. Cockburn’s lyrical approach here on “Let Us Go Laughing” deals in symbolism, using striking natural imagery that shimmers with spiritual significance. This reaction to the awesomeness of the Canadian landscape found in “Let Us Go Laughing” is very typical of Canadian artists, and has been since there have been artists living here over thousands of years, I’m sure. That’s what this song deals with very directly; the undeniable presence of the natural world in all of its scale and fine detail all at once, not to mention one’s very small place in it. In this song, Cockburn is pleasantly overwhelmed by the landscape in this song instead of being provoked into feelings of insignificance. 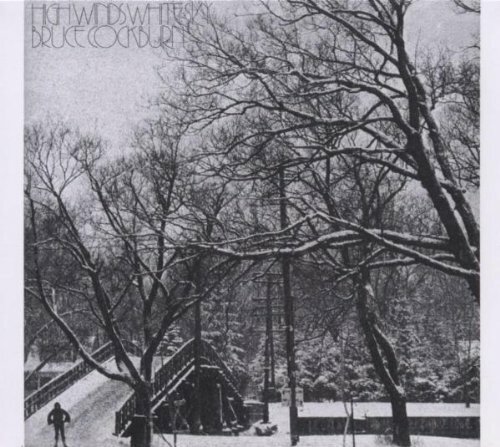 Even the cover of the album shows a minuscule and smiling Cockburn among huge and wintry tree branches looming over him. In the middle of the landscape in this song, he is a solitary figure in an all-encompassing world conjured from his imagination, full of the female presence of the divine as a “pale protectress moon”, and untroubled by the presence of others. By this time in his career, Bruce Cockburn’s songs were the result of the songwriter living very much in an idealized world inside of his own head. There isn’t another human in sight in this song, despite the “us” and evoked in the title. The landscape found in “Let Us Go Laughing” doesn’t subsume him. It insulates him. I was looking for purity in nature, for connections behind things. There is some Christian influence to be found on these albums, but just as often the mystical influence was Buddhist or from occult lore… There is also a mystic quality to the vast unspoiled landscapes of the Canadian north and west, which I got to watch unravel under the banner of “progress” during the seventies. That connection with those landscapes would eventually motivate Cockburn’s reaction against those forces of “progress” and would inform his more politicized brand of spirituality to emerge later in the decade. During that process, he would find himself increasingly unable to be as detached and solitary as we find him here on this song. The mysticism that characterized his first three records would continue to be a constant and vital element in varying degrees through out his career. But they would slowly drift down to earth by the end of the seventies. Other people and their needs would soon begin to populate his work, filling out the landscapes where he’d once stood alone. It’s not as though that connection to the mystical and mysterious was completely abandoned. It is the richness of that inward-looking approach reflected in “Let Us Go Laughing” that allowed him to transform from solitary mystic to the globe-trotting “songwriting-as-reportage” artist he would become. In this, Cockburn’s mysticism and activism aren’t so separate as one might assume, but rather two modules of a whole personal and artistic journey, not unlike Blake’s Songs Of Innocence and Experience. Cockburn’s work in the eighties would unfold accordingly, when he would depart from his inner world of pastoral landscapes, and go up against chaos (to quote another song of his) on a very different spiritual and emotional terrain that would see him grow in stature as an artist. Take a look at this interview from 2013 with Bruce Cockburn in which he talks about his musical influences, his motivations as a songwriter, his spirituality, and his work by then on that new memoir Rumours of Glory, which you can now buy right here. And don’t forget to visit Brucecockburn.com for upcoming releases and tour dates.